Today, organizations run lean and employees are expected to be smart, fast and versatile. The same holds true for MFPs. These Systems gives you all of that"and more. Powerful management tools make it easy to build and maintain highly productive workflows to streamline your document-related processes. Plus, a host of physical and logical security features give you multiple ways to protect your documents and your data. Exceptional performance from features such as internal finishing makes it a perfect system for centralized printing environments so you can get rid of the hassle and expense of multiple personal printers and produce professional-quality documents in-house. 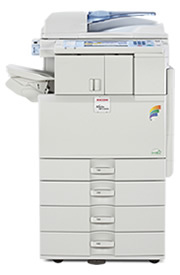 Conserve valuable office space with a compact system that can be configured to meet your specific needs. You can even add in-line finishing capabilities with just a minimal increase to the systems footprint. Manage simple tasks or complex jobs easily with the 8.5" full-color LCD display. The intuitive display allows users to preview stored documents for accuracy prior to printing " and view animated guidance for operational assistance. Streamline and simplify print jobs with icon-driven Ricoh one-click, preset PCL6/PS3 user interface drivers as well as XPS and optional genuine Adobe PostScript3 drivers. Optimize your most critical workflows with the Embedded Software Architecture, a Java-compatible Software Development Kit (SDK) that makes it easy to create unique system and network management applications. Save time and minimize network traffic with PDF Direct Print, a convenient capability that allows end-users to print PDFs without having to open them in Adobe Acrobat. Connect any PictBridge-enabled digital camera to the system and print brilliant, full-color photos in seconds.